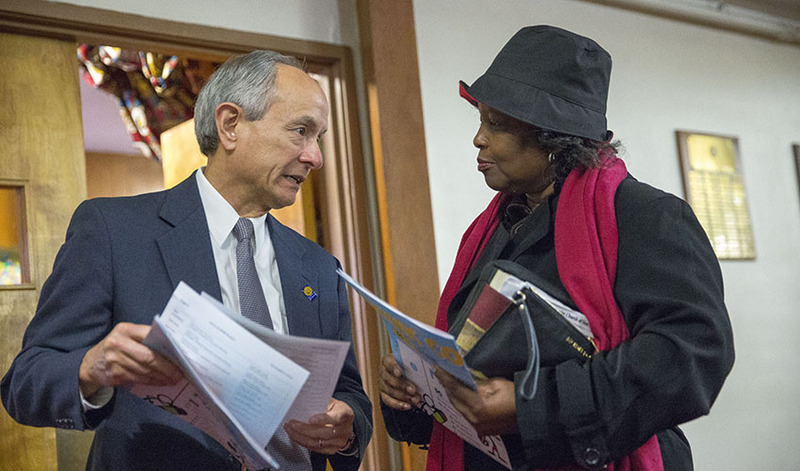 President Les Wong, seen above at a San Francisco congregation during Super Sunday 2015, will again participate in the annual CSU event aimed at encouraging youth to pursue a higher education and increasing the number of African Americans who earn college degrees. "Opening the pulpit to anything but the [Sunday] service, that’s a very big deal," said Kenneth Monteiro, dean of SF State's College of Ethnic Studies. "Across the state, a lot of churches are doing this. It’s 100 churches, some in large cities, some in smaller communities. It’s a powerful partnership." Between Feb. 14 and 28, leaders from SF State will visit five different church congregations within San Francisco to inform young students about the advantages of earning a bachelor's degree and the best ways to plan and prepare for college. After the service, CSU representatives will be available to speak with students about the application and financial aid process as well as advise students on placement exams, tutoring resources and GED or course requirements. SF State's Super Sunday presence is part of a series of events across the state organized by the CSU African American Initiative, which aims to increase the number of African Americans who earn college degrees. These events now include Super Saturday, a college fair by the CSU African American Initiative designed to provide students and families from historically underserved communities with important information about preparing for, applying to and graduating from college. Click for more information about the CSU's "Super Sunday" initiative.